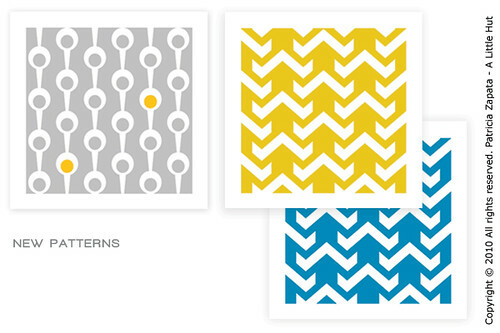 These are two designs that I've posted on Spoonflower. One is an older design and the one on the right is the latest one I played around with in the spring. Some of you may wonder about my occasional ventures into fabric. The truth of the matter is that I really would love to see these on paper. While that happens (if it does, that would be another can of worms—albeit an exciting one to tackle) I like my patterns to at least see the light of day. The fabrics with yellow in them will become cushions that are badly needed around here. We'll see if I like them when I get them done. Aside from our yellow kitchen our living room, studio and entrance spaces are decorated with neutral earthy tones and I know these would seriously jump out. But it doesn't hurt to try, right? Thank you to OhDeeDoh for including my Alphabet Flash Cards in an adorable grouping of school-inspired decor.